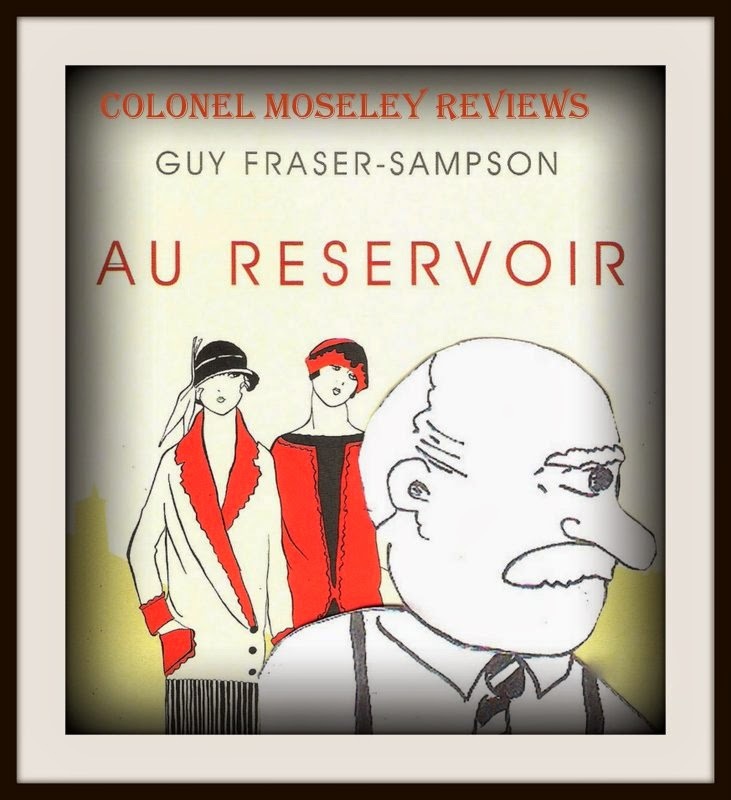 Colonel Moseley: Colonel Moseley reviews "Au Reservoir"
The only advantage of being hors de combat with food poisoning following some questionable roquefort is that successive uncomfortable nights have been occupied with reading "Au Reservoir," the final instalment of Guy Fraser-Sampson's trilogy of "Mapp and Lucia Novels." As an avid Bensonite, I was gratified that in the preface to his second instalment "Lucia on Holiday," GFS very kindly acknowledged that he had shamelessly plundered my http://mappandluciaglossary.blogspot.com. , intended as my homage and a companion to the canon of my favourite six comic novels. My overriding intention in also blogging amateur EFB fan fiction in my spin-off Inspector Morrison stories was to stay as reasonably close as possible to gifted author Fred's sensibility and values - which were those of a well-connected, donnish bachelor of great charm and wit. I recognise however that there are additional constraints upon a commercial author, where appeal to a much wider audience is an imperative. I was interested to find that some aspects of "Au Res" echoed my own earlier stories, such as Lucia's aspiration to dame-hood ("damery" apparently - although sadly not "damification") and prominent coach travel. As an unapologetic Benson nerd, some elements surprised - such as the deflation in Lucia's premium for Mallards from two thousand to one hundred guineas. Also, cucumber salad or tomato? Much of the set piece comedy worked well, such as Mapp and Diva's breathless gallop over the cobbles of Tilling. Almost as if written with TV in mind? Always an option. I also enjoyed the rapport and interplay between Georgie and Olga. Perhaps necessarily to echo the original, some elements were a tad formulaic, with Diva "telegraphing" and all maids "bobbing" so often that they risked repetitive strain. Possibly, Mapp frothed rabidly too long and too often. As with the preceding novels, I wondered if this sensual Benjy, or indeed this Gielgud flirting with a waiter at Sheekey's, so long before Woolfenden, could have stemmed from Fred's more matronly pen. I had no such problem with the Wyses, Bartletts, Diva or Irene who were each comfortably authentic. This was even more true of Olga, Georgie and Lucia, who dominate the tale which - like all the best ones - is ultimately about love. The story has an appealingly autumnal and elegiac air. Growing old really is bloody, even in the bracing air of Sussex by the sea. I would not dream of spoiling the ending and will only remark that I found it well-handled, apt and touching. It is interesting to contemplate the entertaining Tilling of GFS. It is not "my" Tilling, nor in my view, is it entirely Fred's, but like Heaven and Hell, Tilling belongs to each one of us and we all have our own vision of it. Naturally, I still prefer Fred's Tilling, but this one is well worth a visit.